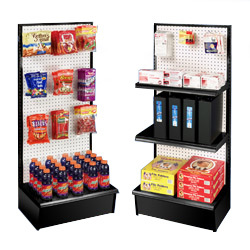 This 1-sided retail gondola kit is a complete package that includes not only the base unit but also two shelves and 10 peg hooks. 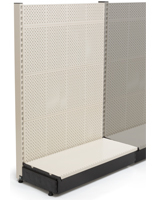 Users have the ability to customize the fixture exactly as needed. 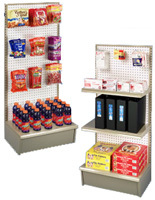 The retail gondola kit has shelf slots that are 1" apart, so the levels can be adjusted according to the size of the displayed merchandise. 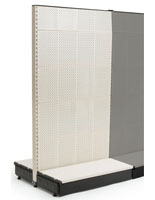 The gondola kit also has a 1/4" thick pegboard panel made of durable hardboard with a white finish. 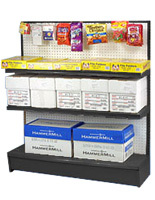 In addition, each merchandising display set comes with (10) 6" long peghooks. 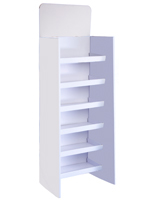 The gondola kit assembles in mere minutes without the use of tools, as all the parts snap securely together to create s sturdy fixture. 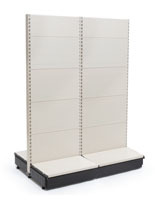 This retail shelving unit can be used alone or by lining up multiple units together for a larger display area. 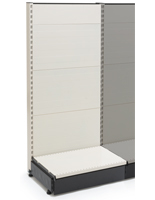 24.0" x 56.0" x 20.0"